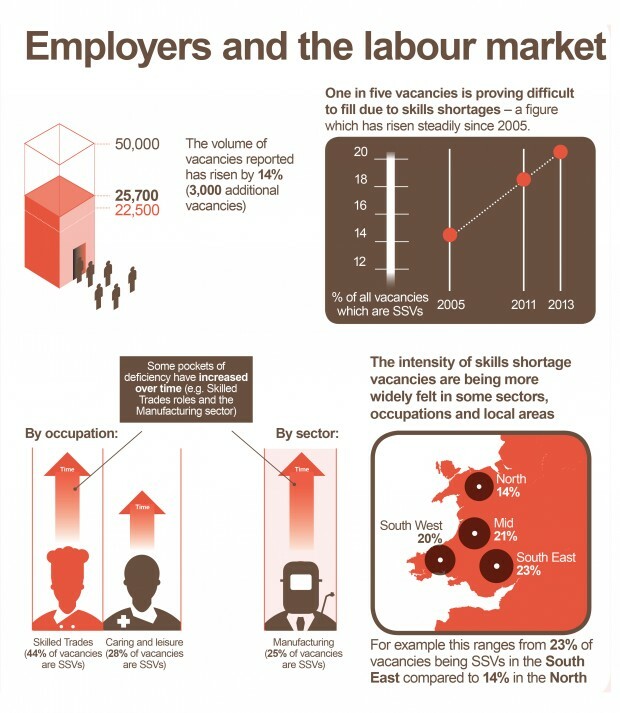 This post uses our UK Employer Skills Survey 2013 data to explain skills shortage vacancies in Wales. What is a skills shortage vacancy? How is it different to a skills gap? If you’re one of the 5,996 businesses that answered the UKCES Employer Skills Survey in Wales last year, you’ll have a good idea. A skills shortage vacancy, or SSV, is a type of vacancy caused by a shortage of skills or experience the employer looks for. We work out this number by asking businesses a series of questions about their hiring. First, we ask if they have any vacancies for staff at all. Then, we ask if any of these vacancies are proving hard to fill – for any reason. For example, a vacancy might be hard to fill if there’s too much competition from other employers, or if the business is located in a remote area. If the employer says yes, they are finding some vacancies hard to fill, we ask if any are hard to fill because applicants are lacking the skills, qualifications, or work experience they are looking for. If the answer to this question is yes, then we count that as a skills shortage vacancy. The difference to a skills gap is that skills gaps are problems with skills inside the business – a problem with the existing employees. SSVs are problems with not being able to find the right skills outside the business. How common are these in Wales? In terms of employers reporting, not all that common - 4% of establishments said that they had an SSV in 2013. However as a proportion of all vacancies the figure is much higher, 1 in 5 vacancies (20%) was reported as a skills shortage. But while across the whole economy there aren’t many employers reporting SSVs, they are concentrated in specific sectors and occupations. When this happens they can cause real problems. So what kind of businesses have skills shortage vacancies? Because a business could find a vacancy hard to fill for a number of reasons other than skills problems, looking at SSVs as a proportion of vacancies gives a good indication of how concentrated skills shortages are. Agriculture in Wales has the highest concentration of SSVs: almost half (49%) of vacancies in 2013 were reported as skills shortages. The sector with the next highest density was business services, which includes real estate, legal services, accountancy, architecture, and advertising. Here almost a third (30%) of vacancies skills shortage vacancies. And what kind of jobs are affected? Similar to how specific sectors have greater density of SSVs, different occupations show different concentrations of skills shortages. The highest by some way is skilled trades occupations, where 44% of vacancies were due to skills shortages. Skilled trades is a label we attach to occupations that require complex practical skills and substantial training, such as electricians, motor mechanics, plumbers, carpenters, and so on. What stands out to you from the Wales results of the Employer Skills Survey? Let us know in the comments or @ukces. The relationship between skills shortages and attraction strategies is pivotal. It doesn't matter how much available labour there is in the market, if individuals fail to see concrete reasons to engage in careers and employment, they wont. Leaving aside the lack of employer investment in craft and technician level skills for the moment, the main underlying reasons for the lack of potential recruits qualified at intermediate / technical level is the need to drive young people with the ability and appetite to do these jobs to good quality vocational education and training opportunities that will help them develop the skills knowledge and experience to do these jobs.